Your web-master has had excellent results from Political Campaign Signs. 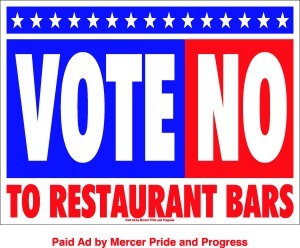 Heritage Yard Signs can help provide valuable resources in a Liquor referendum, I have used them on Ten Commandments and political campaigns. Heritage Advertising is always willing to provide any assistance possible and takes an interest in helping you win your campaign. They have extensive experience in Ten Commandment Display, No Lottery and many Conservative, and political campaigns. They offer very competitive pricing and reliable service. Printed on durable, corrugated material, these campaign lawn signs are guaranteed to last at least two years! You can have your yard signs done on several different colors of chloroplast, including white, yellow, blue, red, and others. Remember, the color of the chloroplast board doesn't count in the number of colors of ink. Screen-printed on white, weather-resistant polycoat poster board, they are easy to assemble. These yard signs are less expensive than cloroplast and should easily last throughout the length of your liquor compaign. Poly-bag yard signs use a weatherproof, no-show through material in two different sizes. Printed on both sides, these yard signs come with steel frames included. For short-term campaigns the Polycoat Poster Board yardsigns are adequate. The longer the campaign the more you should consider the Corrugated Chloroplast Plastic lawn Signs. I have one of these that has been outside at my drive way over a year and it is still in great shape with no weather or sun damage visible. We recommend that you visit the Heritage Advertising campaign signs, cheap t-shirts for more details and pricing or contact them by for additional information. This could be your edge in your campaign to stop the expansion of liquor and alcohol sales.